This post is brought to you by Busch Gardens Williamsburg. We were treated to a complimentary day at the park. Affiliate links are included in this post. All opinions are my own. I love theme parks – the thrills and the shows and all the fun memories you create as a family. But there’s one thing no one enjoys about a theme park–the lines! Paying an admission fee and planning your day only to have it spoiled with long lines can be a drag. We went to Busch Gardens Williamsburg 2 weeks ago, it was our first time exploring this park as we just moved to the east coast this past December. We were all so excited to go, until we heard there was rain in the forecast. Would the rain ruin our fun day we had planned? 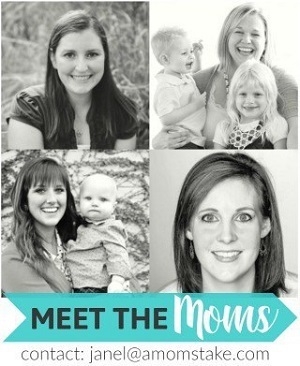 Would the kids be miserable? 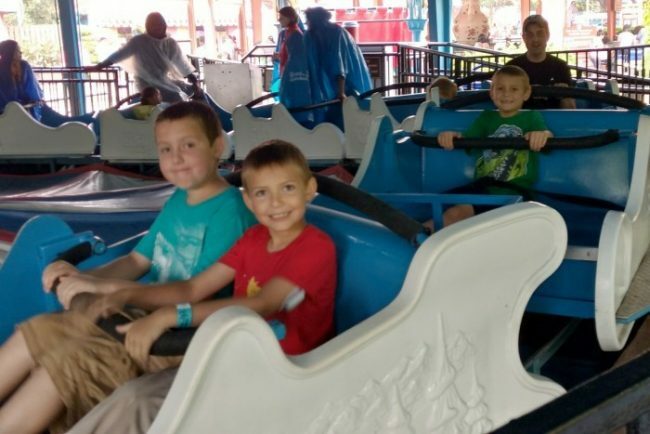 While it was an incredibly wet day at the park, we discovered there are so many benefits to visit a theme park on those wet and rainy days! 1. Almost no lines – When it rains at a theme park, the ride lines are rarely full. Every ride we went on, except Busch Garden’s newest ride InvadR, had a 5 minute or less wait! It literally felt like we were walking right on up through the queue and onto the ride. With the incredibly short wait times, we took advantage of the opportunity to ride on our favorites a couple of times, before moving on to the next big ride. My favorite ride from the day was Griffon – a free fall dive coaster. It was an incredibly, and absolutely terrifying ride; the best coaster I’ve been on in a long time. There’s a moment when they pause for what feels like eternity just-over-the-edge of the massive 205-foot drop. 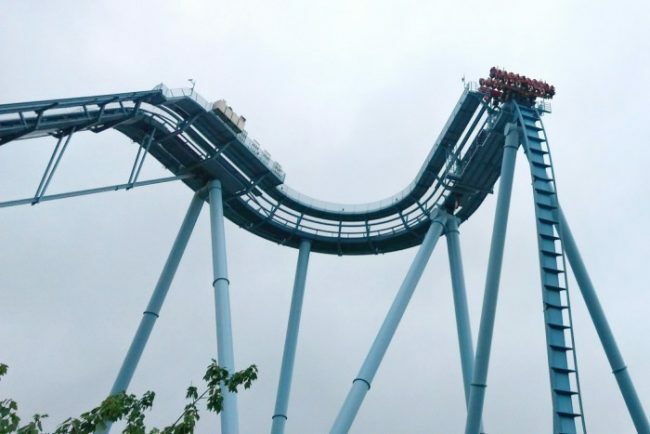 Then, the coaster is released and you find yourself screaming harder than you ever have in your life as you drop in a 90-degree free fall at 75 mph. It definitely pushes the rush and excitement of thrill roller coasters to a whole new level. To be able to literally walk onto a ride like this, twice in a row, is unheard of, and worth the rain every time! 2. 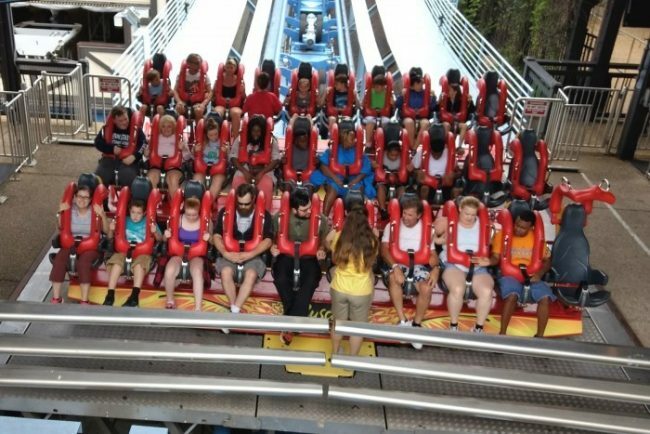 You won’t be hot and sweaty – Along with the long lines theme parks are typically known for is becoming incredibly hot, sweaty, and tired from all the heat while you wait. I would pick a cool day, even a wet and rainy day, over a hot and humid day every time. You won’t be tempted by all those treats and cool drinks sprinkled throughout the park. When you visit on a hot summer day you’re going to be eyeing every one who passes by with a Dole Whip, gelato, soft-serve cone, or a cold, fruity drink. 4. You will actually see the other attractions – Sometimes, a visit to the theme park means hit as many big coasters as possible and go-go-go until you crash. When you can hit all the big coasters, and then see all the rest of the park you might normally pass by you’ll realize there’s a lot you’ve been missing. Busch Gardens offers a variety of shows and attractions that are really so different than what you’ll find at other parks. 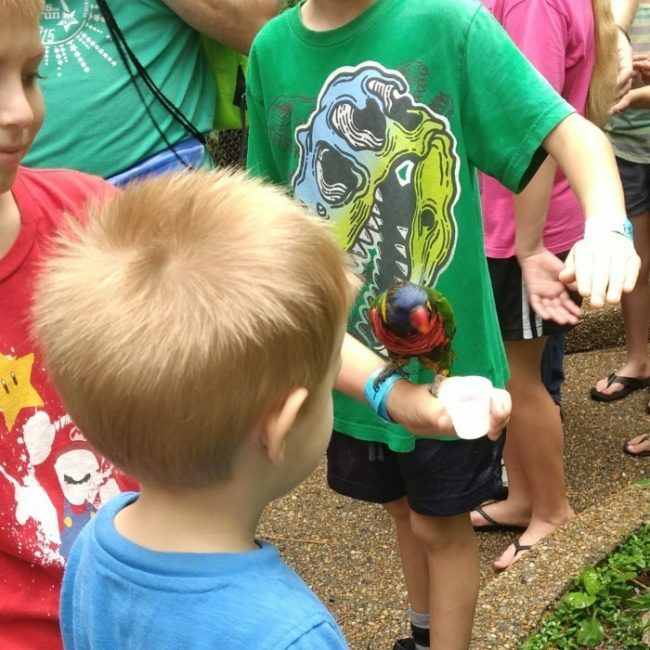 They have animals in the park including eagles, wolves, and our favorite the Lorikeet exhibit where you could feed the birds and they would fly right to you. They have a couple of animal shows to learn more about the different animals at the park. 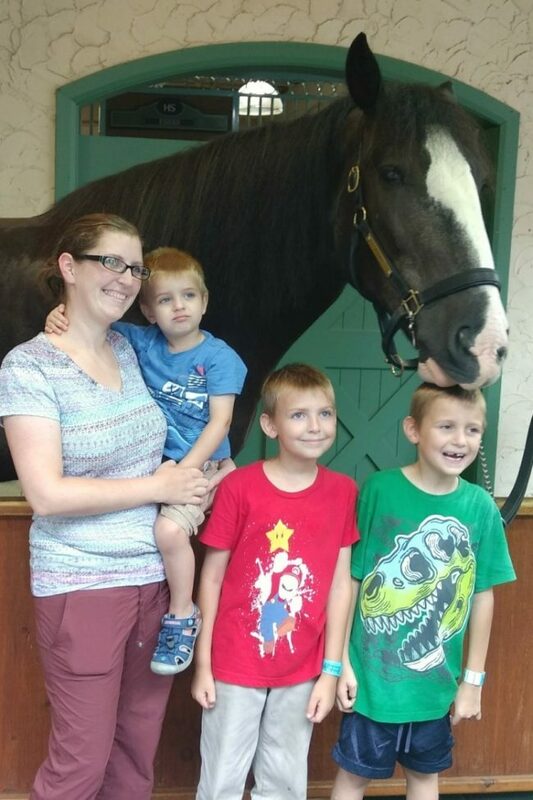 They even had massive Clydesdale horses out for a photo opp. This park is really so much more than just coasters. You can also check out some of their performances including the All For One production under the stars with sword fights and loaded with action. You’ll also find a variety of musical performances like Celtic Fyre with Irish music and dancing, Britmania to relive all the top British hits since the 1960s, or experience Germany music and dancing at OktoberZest. There’s even a sing and dance-along performances with Elmo for the younger crowd. You might even end the night with a Fireworks show or a concert on select evenings. 5. You’ll create memories not soon forgotten – At one point, the rain started coming down so hard that everyone in the park, us included, ran for cover under the nearest attraction. For us, that was the tea cups ride, Turkish Delight. 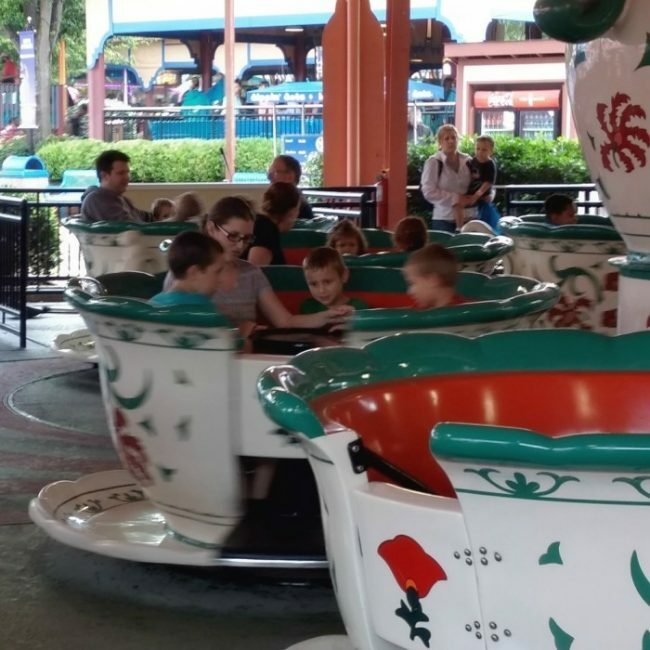 My older boys and I all crammed into a tea cup while my husband, who can’t stomach the tea cups, waited for us with our toddler. We had a blast spinning around and around and trying and the whole world around us, with all its downpour, was the farthest thing from our minds. We were laughing and enjoying every second of our time, despite the rainfall, and it gave us some really funny moments we won’t soon forget, too. Busch Gardens even hosts concerts in the park throughout the summer that are included with your ticket admission price. We were there the day MercyMe came to the park. 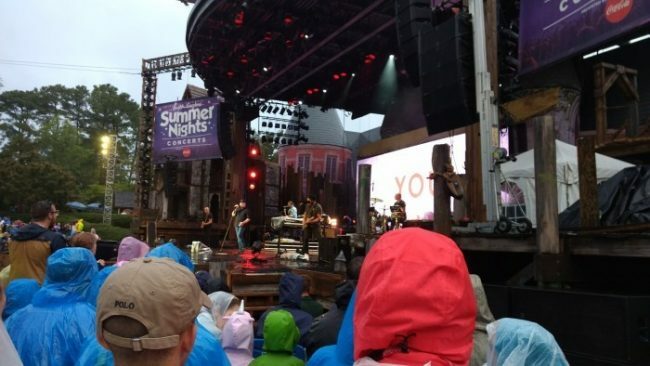 While the fans, ourselves included, huddled under umbrellas in the open amphitheater seating waiting for the showtime to start, there came a point when the band would be coming out soon and it was time for the crowd to embrace the rain. One of the hosts came out to ask the crowd to collapse all umbrellas before the show began and rallied us up for the amazing band that was there to perform for us that day. 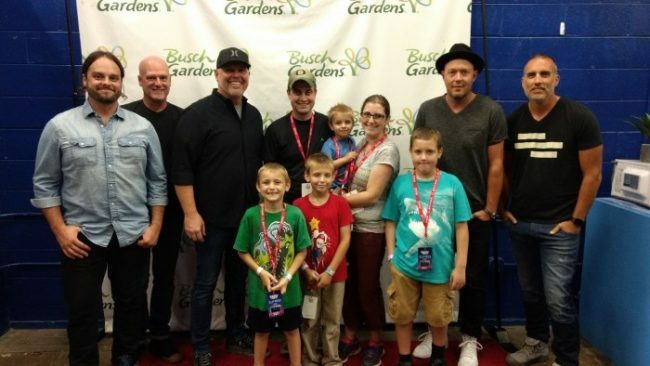 There was a special bonding moment for our family–and the crowd–as we sang our hearts out along with MercyMe even with the rain pouring down for the first 15 or so minutes of the show. Would I have preferred a show without all the rain? Probably. 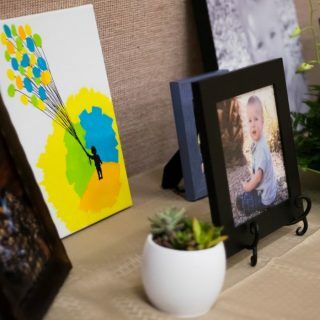 But it cemented the experience and the entire day as a one-of-a-kind summer event. The alternative would have been a hot and humid day that left us sweaty and extra tired from the heat. Start with a Height Check – When you first arrive at the park, you’ll enter through England. Each area of the park is designed after different countries with adds a really cool element to the park. Before leaving England to head off to your desired starting point, stop at the Height Check station. Your kids will get a wristband with their height so that you can avoid the tears over rides they’re not tall enough for and plan your day accordingly. It also means really easy access to the rides they are tall enough for, without the check and recheck of their height at each of the attractions. 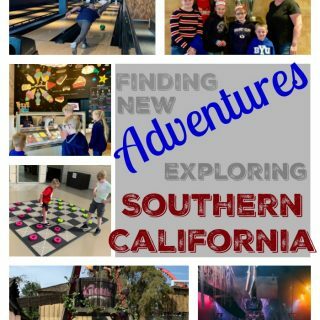 Visit the KIDsiderate Attractions – There are hidden gems all throughout the park that are designed to make the day exciting and fun, even for the youngest person in your group. With animal attractions, play areas to get the wiggles out, and a two whole areas designed for little ones – Land of the Dragons and Seasame Street Forest of Fun. There are water play areas, for those day’s it’s not already a “water park” from the rain, and lots of rides for little kids. It’s easy to find the attractions for young children with the “K” logo, for KIDsiderate, labeled on the park maps. 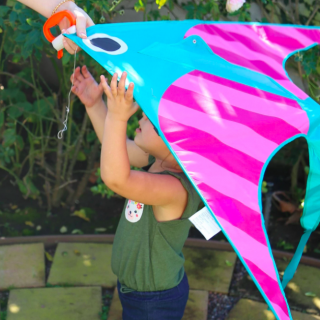 If you’re traveling with young kids, you can still make the most of your day with Child Swap. 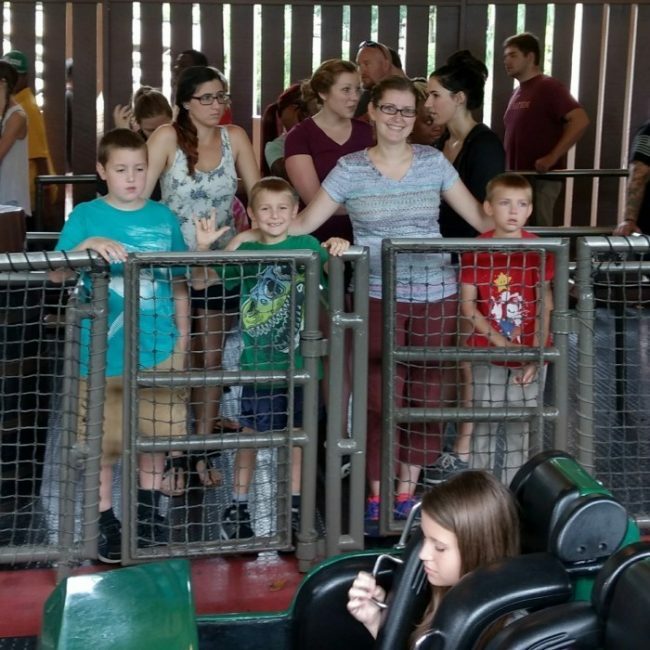 One parent waits with the children that can’t board while the other rides. Then, you’ll cut the line by going in through the exit to ride on the next available spot. One of my all time favorite bands, Lifehouse, is coming to Busch Gardens on August 19th. I’m already planning my visit back to ride the coasters and then enjoy my favorite songs. Friday nights in August bring fireworks. You’ll also catch some special foods through summer like fried pineapple and a kalua pork slider! Fall will bring Bier Fest starting on September 1st and Howl-O-Scream starting September 23rd. 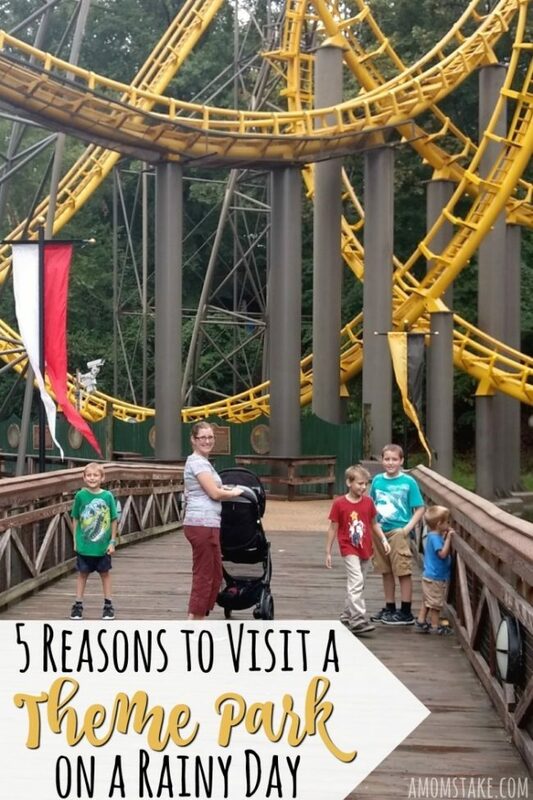 There’s just so much to experience at Busch Gardens Williamsburg, you’ll get your money’s worth out of a season pass, for sure, even on those rainy days! 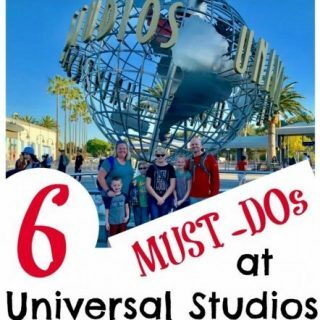 Especially with all the extra savings throughout the park including free parking with an annual pass and discounts on dining and shopping, plus member-only events! Here’s a peek at all the fun this summer at Busch Gardens Williamsburg! What’s your top reason to want to visit a theme park? Previous Post: « 4 Inspiring Motorhome Hacks – Tricks for RV Travel! What an amazing way to enjoy a rainy day! This is super true. I have always been under the impression that theme parks shut down their rides when it is raining. I wonder if one in my area does this. I never thought to go to an amusement park on a rainy day! What a great idea. I like the idea of no lines. I love rainy days at the theme park. I think getting a little wet adds to the memories, but you can’t beat the nonexistent lines. I’ve been to an amusement park a few times during the rain. The only benefit was fewer crowds and being able to get on the rides faster! Overall, I wasn’t a fan of getting rained out. It looks like you guys had a great time, despite the weather! I love to go to theme parks when the weather is dreary. 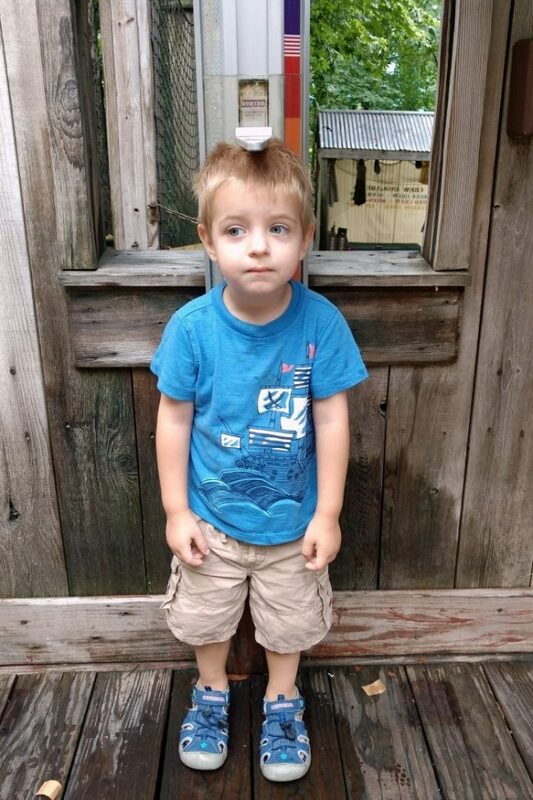 Our Dollywood will close if it rains too much, so you have to go when it’s not too stormy. I would say a very hot day as well as rainy. I went to an amusement park when it was really hot out, and hardly anyone was there. There were a lot of ways to cool down luckily. Just like a rainy day, lines were not long at all either. We are lucky to live an hour away from a great theme park. Some of the best days we have had there were rainy. It is so fun to not have to wait in line to go on a ride. I hadn’t considered this. I think it’s awesome that you were able to have a really good time on a rainy day. I couldn’t agree with you more! We went to a theme park on a cloudy day and there were no lines! Honestly, my favorite time to visit a theme park is on a rainy day! we do not like crowds and find these are the best days to go! Any theme park I’ve ever been to shut down a lot of rides when it’s raining. I haven’t been to one in years, so I don’t know if they offer alternative rides? I have always liked going to parks on cloudy or rainy days. I really do not like lines and as long as it’s not thundering or lightning it’s kind of fun. I definitely hate the lines. Here most of the outdoor rides shut down in the rain, but as long as there are some indoor ones it would be fun to go when the park is less crowded. Undoubtedly this is the perfect way to enjoy a rainy day. I agree with all the reasons to visit a theme park.